The extra plants for sale come from named varieties, plants given to me by friends and neighbors, the names of which have long been forgotten, or never known. There are also varieties, the name tags of which were long carried away by deer. A couple of years ago I started to hybridize my own plants, just for the fun of it. Should these plants become worthy, they could be sold in the future. However, I have no intention of registering any of these crosses. My intention is to keep the whole experience fun. With so many currently registered varieties, it would have to be a very, very special plant to warrant the extra work involved. I’ll leave this to the professionals for now. All the daylily plants are field grown and dug at the time of purchase. They are wrapped in recycled newspaper and put into recycled paper bags for the trip to their new home. All plants are for sale at the same price, whether they are named varieties or not. I am currently growing over 250 varieties, however not all of these will be for sale at one time. As the plants need dividing, they will become available for purchase. We sell at least two fan divisions and clumps when possible. Bonus plants will be given based on the dollar amount purchased. Five percent of all sales will be donated to the Days End Farm Horse Rescue, Woodbine Maryland, www.defhr.org. Since my husband and I are retired Maryland State Government employees and had to undergo salary freezes, no cost of living raises and furlough days during our careers, we offer a 10% discount on daylily purchases to fellow State of Maryland Government employees, with a valid State ID. Thursday through Sunday, 9:30 AM to 3:00 PM. including 6% MD sales tax. 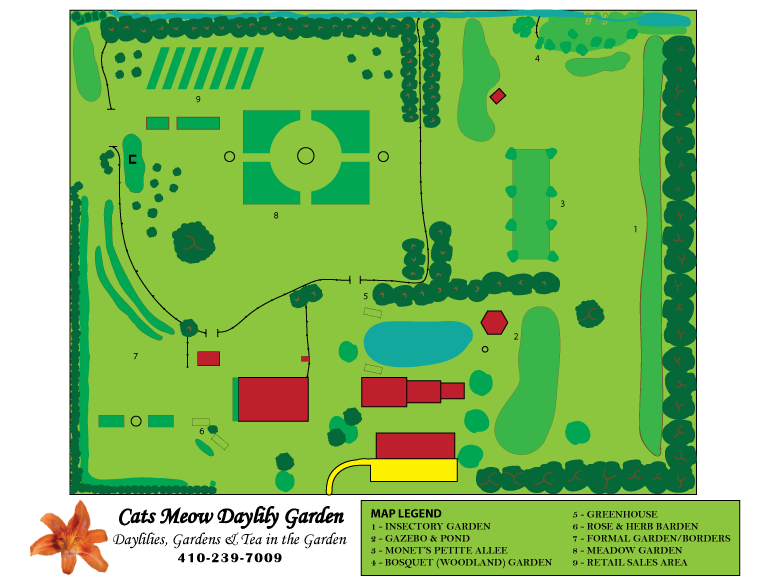 Visit Cats Meow Daylily Garden today, relax and enjoy tea in the gardens.